The newly inducted Congress General Secretary for Uttar Pradesh East, Priyanka Gandhi Vadra returned to India on Monday. Soon after arriving in New Delhi, Priyanka met Congress president Rahul Gandhi at his Tughlaq Road residence. Priyanka attended the meeting at Rahul’s residence with other Congress leaders and discussed the strategy for Uttar Pradesh-East as she has been made the general secretary for the region. Congress General Secretary for UP-West Jyotiraditya Scindia was also present during the meeting with Congress leaders. President of Uttar Pradesh Congress Committee Raj Babbar and party’s general secretary for Karnataka K C Venugopal were also present in the meeting. The meeting lasted for over two hours. 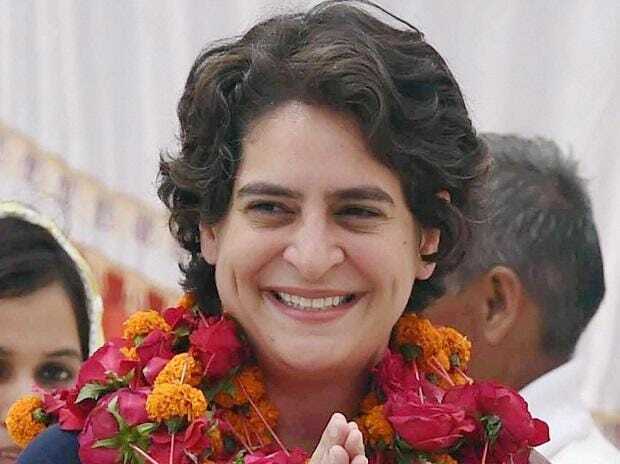 Priyanka Gandhi has been made in-charge of 43 out of 80 Lok Sabha seats in Uttar Pradesh. When Priyanka Gandhi Vadra's name was announced as the Congress General Secretary for Uttar Pradesh-East, she was on a private visit abroad. She returned to India on Sunday. A Congress leader from Uttar Pradesh told ANI that many prominent party leaders of the state were telephoned during the meeting and were asked about the welfare measures and development works being carried out ahead of the Lok Sabha elections. The Congress got only 8.4 per cent votes in Uttar Pradesh in the 2014 general elections. Congress won in Rae Bareli and Amethi. This time it's going to be a tough challenge for Priyanka as Congress had 22 Members of Parliament (MPs) with four seats in Eastern Uttar Pradesh in 2009. The situation became worst for the party after the 2017 state assembly elections, wherein, the party secured only two seats in the eastern region. According to sources, Congress has been discussing Priyanka's Uttar Pradesh tour and preparing a blueprint for the same. Earlier, the party had prepared the schedule for 13 rallies, however, after Priyanka's entry, the party is reworking on its plan. Apart from this, the party is drafting a plan for 17 reserved seats and the Dalit majority seats along with that a strategy has been prepared for which the SC and ST department of the party has prepared a proposal for 4 rallies. Priyanka and Jyotiraditya Scindia will give a final nod to these plans. As per the party source, Priyanka and Congress leaders in Uttar Pradesh will again hold a meeting at Rahul Gandhi's residence on Tuesday. Priyanka Gandhi would also be present at a meeting of All India Congress Committee general secretaries and in-charges of various states, who have been called in Delhi on February 7. The meeting has been called to plan the strategy and review the ongoing preparations for the upcoming Lok Sabha elections.